SaySoForGood Reviews - Legit or Scam? SaySoForGood Reviews – Legit or Scam? 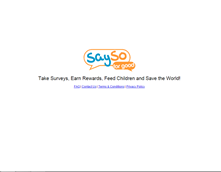 SaySoForGood.com is the online home of the SaySoForGood, a website which claims that they will donate money to charities dedicated to alleviating hunger for every one of their surveys taken. Online market research is one of the oldest and most popular ways of earning money online because people simply need to provide their own opinions and own experiences in exchange for some form of compensation. When companies pay market research companies for the data and information they collect, these companies pass on part of that money to their members as a thank you for their efforts. In the case of SaySoForGood, they also take part of the money they are paid and donate it to charity. It appears that since 2012, SaySoForGood no longer accepts people applying for membership directly to their website. Instead, they use third party survey sources to distribute their surveys to their own members. If you are a member of a third party survey distributer, like Swagbucks, and receive one of their surveys you will take their survey the same way you would take any other survey you receive, and you will be rewarded with points or money or whatever compensation is used by the survey site of which you are a member. But when you take a SaySoForGood survey, you will not only earn rewards from the website you are working with, but you will also be contributing donations to provide meals and assistance to hungry people around the world. The website is clear that their primary goal is to help end deaths from malnutrition across the globe. First and foremost, people who are looking for information on this company should know that the reviews of this company previous to 2012 are mixed at best. There were many complaints about how infrequently they provided surveys and how often people were disqualified from their services once they began. This is a large part of the reason why this company began partnering with other survey distribution companies. This relieved SaySoForGood.com from dealing with a lot of the customer service issues they were having, and instead let them focus on their most important objectives: collecting marketing data and donations for world hunger charities. The website says that for every complete survey, they will take $0.15 and donate it to their two charitable partners, the World Food Programme and Action Against Hunger. Though that may not sound like much, the website says that they are currently doing tens of thousands of surveys each month, and that the WFP says that just $45 can provide a child with nutritious food for three months. Average Rating for " SaySoForGood Reviews " is 1 out of 5 based on 2 reviews. In my opinion this is a fraudulent router scamming survey takers from time to time. I took a 30 minute long survey about my recent travel and airport experience, I answered everything carefully, honestly, passed all attention checks, and arriving at the end of the survey (the last page where they ask me my postal code, I selected prefer not to answer), nowhere did it say it was mandatory to fill it out, or at most it should have warned that this is essential, OR they should have asked this in the beginning of the survey. Instead of redirecting me back to get paid, I get screened out saying I do not qualify to take the survey. SaySoForGood routers are the WORST - I do not have issues with other routers, which is why in my opinion the company running such router is running an alleged elaborate SCAM - Avoid business with SaySoForGood and taking surveys from this one, you will more often than other be scammed for your time and not paid for surveys completed. More so, this router has the habit of unfairly reversing surveys even if you were honest and did nothing wrong. I did a long survey for a gift card After my survey was over and they Collected all my Information the last page said "SORRY YOU ARE NOT ELIGIBLE FOR THIS OFFER" Really ? This was a SCAM they should not be allowed to do this.